How much does Metro spend each year to repair and recover bus seats ruined by food, drink, gum and graffiti? In 2012, the cost was $865,000 in taxpayer dollars to replace stained, carved, graffitied or torn seat inserts. The covered inserts that fit into the back and bottom of Metro bus seats range in price from $10.44 to $23.46 each. In addition to the cost of the inserts, Metro bus divisions expended $1.5 million in labor, replacing both window guards and seat inserts. The most common reason that a seat insert is changed? Graffiti. Last year was not unusual. More than 55,000 seat inserts were replaced … or about one every nine minutes. Bus maintenance works constantly to keep up with seat damage so that the buses look good and we don’t have to sit on dirty or destroyed seats. It’s not easy to keep up. Each bus has between 40 and 57 seats, depending on the size and the style. And with just over 2,200 buses in the Metro system, that’s 88,000 and 125,400 seats that are targets for graffiti. It takes less than 10 minutes to replace a bus seat insert but 1 1/2 hours to replace an entire seat section. An insert, which looks something like a seat float (see photo above), can be unscrewed from their metal supports, pulled out and the new insert pretty quickly added and screwed back in. But a seat section installation — replacement of the entire seat — is more complicated, requiring assembly of the seat supports and inserts before the whole thing can be carefully fastened back into the bus. Replacement of the entire seat is only done as a result of severe damage. In 2012 there were 79 seat installations — the whole seat including metal supports for the 2-to-3-passenger covered seats — on Metro buses. The cost, not including labor, was an additional $220,000. 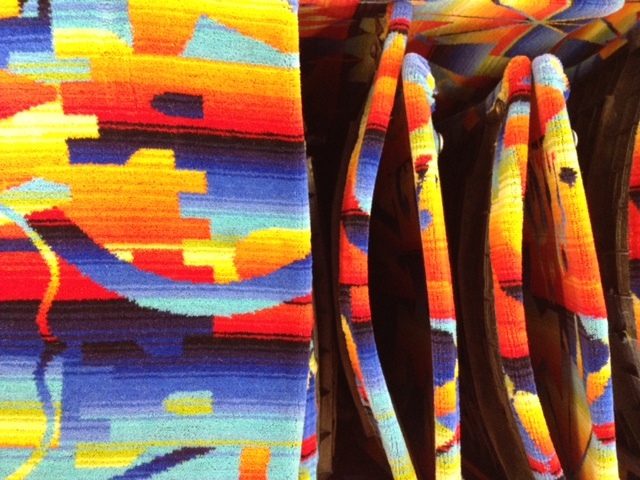 In 2005, Metro changed the design of the bus and train seat covers to multi-colors to camouflage graffiti and make the seats more difficult to mark. But vandals are starting to use new markers and other tools to more effectively destroy the seat covers. In the meantime, seat recovering and repair continues. Passengers who see graffiti/tagging on buses and trains can report it to the Graffiti Hotline at (800) 675-4357 (select #2) . This hotline is available with live operators 24 hours a day, seven days a week. If you have a cell phone, please put the number in your contacts so it’s handy. Wouldn’t it be more cost-effective to switch to all plastic seats like they have on the Muni in SF? Or are those hard to keep clean as well? The plastic feels cleaner to me than fabric. Many years ago, RTD did have plastic seats. But a decision was made to go to the fabric for aesthetic reasons and the comfort of the passengers. Thanks! Why not make it 1-wide aisle-1 cross seating pattern? Or seats that face the aisle altogether? The less seats there are means less seats to clean. It then becomes more savings to taxpayers & more standing room space for more passengers. There’s no need for “excuse me can I sit there” squeezing everyone to seats and narrow aisles with people sticking their butts into sitting passengers faces in a 2-narrow aisle-2 cross seating pattern. But I guess Metro doesn’t want to do that because doing things that makes sense and cost efficient means one less excuse to keep asking taxpayers for more money. Tell you what, Cynthia R-YOU STAND on an MTA bus for a good 30 minutes PLUS, and see how YOU enjoy the experience! Then come back to this forum, and explain why you think there needs to be LESS SEATS on MTA buses! I do it daily as with other people on my bus. The bus that I get on is so crowded that all the seats are taken when we board. Everyone else down the bus stops ends up having to stand for over 30 minutes. And we have to deal with sitting passengers hogging up all the space because they’re “lucky” to have got on earlier down the bus stop. And they never get off until the very end. And since the aisle space is so narrow we get our feet jammed in between the seats. And when these people sitting get off, you go through the musical chair circus of excuse mes and squeezing through and shifting legs. • LACMTA is getting the reupholstering done at cost far cheaper than any other US city of equal size. • The requested fabric is a complex design that comes from England (best wool). The fabric alone takes over 2/3rd’s of the unit price. Why use such expensive fabric? Some will say for fire resistance. Have you ever seen a bus that was in a fire? About a million other things will ignite before the seats do. • Plastic seats are an easy vandal target, do not absorb body fluids (sweat, etc..), are cold in winter, and hot in summer. Use less expensive materials, and LACMTA could add more busses during peak hours. I Have A High Interest In Buses , And I Want To Become A Bus Operator For Metro Los Angeles . So Whenever I See Stories Like This , It’s Really Cool To Me To Learn How Maintenance Changes Things And Other Stuff To Keep Metro’s Buses And Trains Running Good And Clean . Do They Change The Seats At Central Maintenance Facility ? Keep Up The Good Work Metro On Keeping The Buses And Trains Looking Good And Running Good !